Denzel Washington, Chris Pine and Rosario Dawson star in the action thriller Unstoppable, available on DVD and Blu-ray. Watch the movie trailer and see the cast and plot summary below. With an unmanned, half-mile-long freight train barreling toward a city, a veteran engineer and a young conductor race against the clock to prevent a catastrophe. MPAA Rating: (PG-13) for sequences of action and peril, and some language. 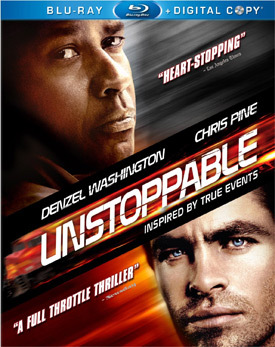 Oscar-winner Denzel Washington and Star Trek’s Chris Pine team with action maestro Tony Scott in this non-stop thriller. A massive unmanned locomotive, nicknamed “The Beast” and loaded with toxic cargo, roars through the countryside, vaporizing anything put in front of it. A veteran engineer (Washington) and a young conductor (Pine), aboard another train in the runaway’s path, devise an incredible plan to try and stop it – and prevent certain disaster in a heavily populated area.